These particles are left behind when plant materials degrade or are burned. The siliceous phytoliths typically become amorphous, transparent particles of distinctive shape. When burned they often become coated with a layer of carbon and appear black or gray. 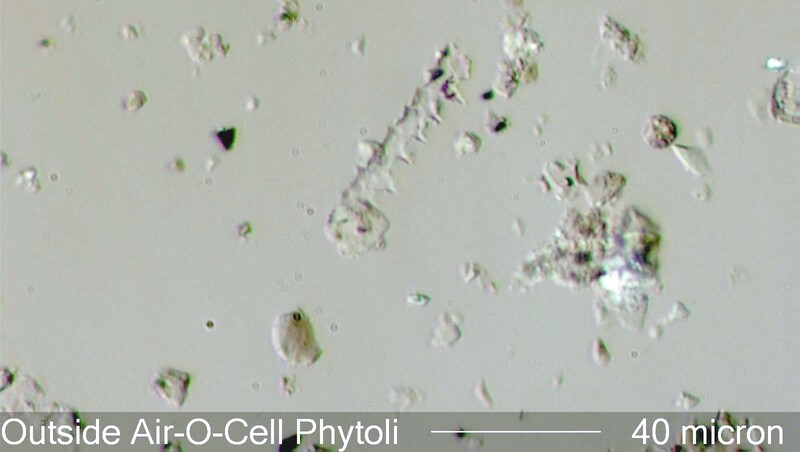 Calcareous phytoliths may remain intact as the plant degrades but they often go through a series of chemical reactions that ultimately result in the formation of a calcium carbonate. When burned they convert to calcium oxide, which then reacts with water and carbon dioxide to form aragonite (calcium carbonate). Cubical calcium oxide and hydroxide particles are common in the plume from the combustion of wood, often showing surface modification to the carbonate. The surface modification is evident as a birefringent film over part of the particle.